Am I correct in assuming that Truman and only Truman had the authority to order the bombing of Hiroshima? After all, it was the very first A-bomb and procedures may not have been formalized yet. It occurs to me that maybe a theater commander like Gen. MacArthur could have given the order. Given that Truman was at Potsdam when he made the decision to bomb Hiroshima, did he have a secure method of communications to use to communicate his order from Potsdam? If so, what was that method? When was that order actually given? I'm guessing it was at least several days before the bombing since someone had to order the bomb moved to Tinian and a plane and flight crew chosen and assembled at Tinian. Could Truman have aborted if he'd changed his mind? How late could he have successfully aborted? Right up until the bombardier pressed the "Bombs Away" button? Or would it have been early, say up until the moment Enola Gay left Tinian, after which it might have been running silent? I realize this is all academic now but it's not impossible to imagine Truman having a change of heart and deciding not to bomb Hiroshima. Let's say the Japanese surrendered on August 4 because they could see that the war was lost. I'm curious how late he could abort the bombing if he'd really wanted to. Truman retained mission authorization within the Oval Office, but all further details were delegated through the normal chain of command to Colonel Tibbets to plan the mission. Once the Japanese response to the Potsdam declaration, Mokusatsu, had been sent and received, it would have been tacitly understood all around that any further decisions could only be implemented on a best efforts basis. Mission authorization was given and Tibbets arranges a suitable date according to weather forecasts. Aboard the Enola Gay the bomb was armed after take off and its safety devices removed about 30 minutes before it was dropped. Conceivably that latter process could be reversed, but I am unsure that it would have been attempted. The bomb could always have been dropped at sea for disposal, though General Groves would likely have been most disappointed at that result. Note that any last minute communication from the Japanese would have been received with extreme skepticism, as merely a delaying tactic. It is unlikely to my mind that any such would have had the slightest bearing on the Hiroshima mission. The key point here is that there were no special go/no-go arrangements for the mission. Once authorized it was expected to take place at the earliest suitable opportunity. No arrangement for recall subsequent to launch was planned for because any abort decision was up to the commander of the mission, Colonel Tibbets. of which Byrnes is aware. Featured document in this section of the exhibit: Secretary of War to Harry S. Truman, July 30, 1945, with Truman's handwritten note on reverse. No known written record exists in which Harry Truman explicitly ordered the use of atomic weapons against Japan. 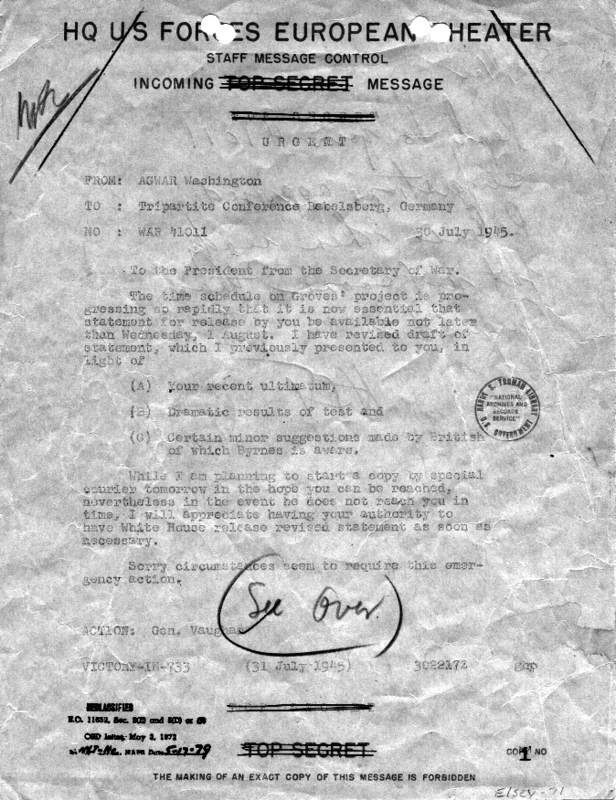 The closest thing to such a document is this handwritten order, addressed to Secretary of War Henry Stimson, in which Truman authorized the release of a public statement about the use of the bomb. It was written on July 31, 1945 while Truman was attending the Potsdam Conference in Germany. In effect, this served as final authorization for the employment of the atomic bomb, though the expression “release when ready” refers to the public statement. April 1939 - Germany begins developing their atomic bomb. August 2, 1939 - Albert Einstein sends a letter written by Leo Szilard to Franklin Roosevelt, warnings of an atom bomb being developed by NAZI Germany and recommending America needed its own atomic program. Effectively starting the US nuclear program. August 19, 1943 - Churchill and Franklin Roosevelt agree on the Quebec Agreement, outlining the terms for the coordinated development of the science and engineering related to nuclear energy, and, specifically nuclear weapons. March 25, 1945 - Albert Einstein Writes again to Roosevelt to say the scientists working on the bomb need more contact with the decision makers who will decide to use the bomb. April 24, 1945 - Sec Defense Henry Stimson schedules a meeting with President Harry Truman to tell him about the Bomb. May 9, 1945 - Truman establishes the Interim Committee to recommend temporary wartime controls on how to handle the bomb. May 12, 1945 - Second meeting of the Targeting Committee, and first mentioning of Hiroshima as a target. July 17th - August 2, 1945 - The Potsdam Conference Meets. July 27th 1945 - Potsdam Declaration is made to Japan calling for the surrender of all Japanese forces by the allies, the declaration lays out the conditions. Doesn't mention the bomb but says unless Japan surrenders it faces "prompt and utter destruction". Japan does not respond and the allies( US and Britain) take this as a rejection. Soviet Union is not part of the decision as it is still neutral in the Pacific War. July 30, 1945 - Secretary of War to Harry S. Truman, with Truman's handwritten note on reverse. 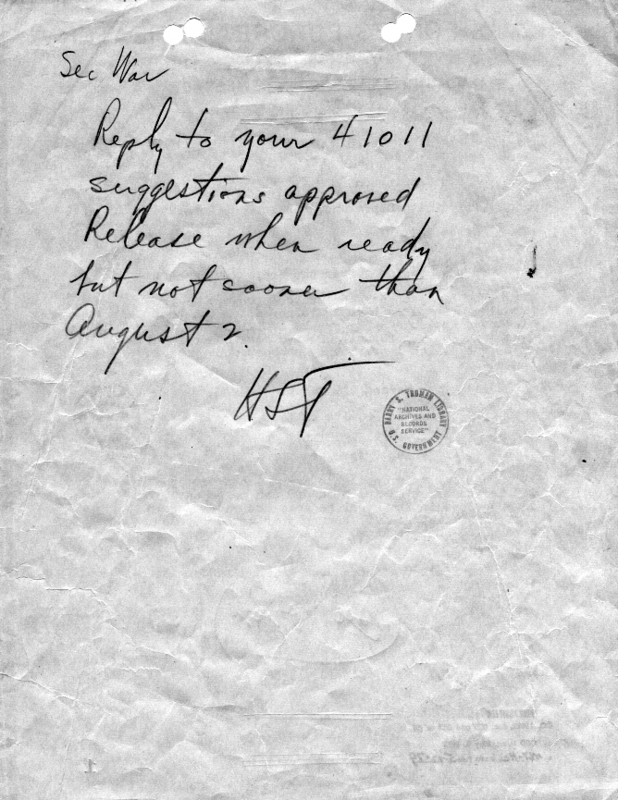 Truman hand writes approval for press release upon dropping the bomb. This effectively is the Presidents final approval to drop two atomic bombs on imperial Japan. Aug 6, 1945 - The Enola Gay drops the first Bomb on Hiroshima. Aug 6, 1945 - President Truman on board the USS Augusta in the mid-Atlantic returning to the United States from the Potsdam Conference" when he was informed that the bomb had been dropped. Aug 8th, 1945 - Soviet Union declares war on Japan. Aug 9, 1945 - The Bockscar drops the second bomb on Nagasaki. Aug 15, 1945 - Japan Announces Surrender. Yes Truman made the decision to drop the first two Atomic bombs on Hiroshima August 6th 1945, and Nagasaki August 9th 1945. Truman also approved the targets both of which were recommended by a presidential committee called the Interim Committee made up of Presidential cabinet advisors. Within Days of being told of the bomb's details he established the Interim Committee made up of Cabinet Officials. The Interim Committee created a military advisory group as well as a scientific advisory group and these men recommended the targets for the bomb as well as recommended the logistics. The Interim Committee had both scientific advisors and military advisors in selecting the targets, which Truman approved. Truman had made the tentative decision to move forward with preparing to drop the bomb before Potsdam. The Final Authorization was given July 31, 1945, by Truman at Potsdam. Truman, Churchill, and the Interim Committee all communicated by way of Cables and secret courier. No known written record exists in which Harry Truman explicitly ordered the use of atomic weapons against Japan. The closest thing to such a document is the handwritten order, addressed to Secretary of War Henry Stimson, in which Truman authorized the release of a public statement about the use of the bomb. It was written on July 31, 1945 while Truman was attending the Potsdam Conference in Germany. In effect, this served as final authorization for the employment of the atomic bomb, though the expression “release when ready” refers to the public statement. Am I correct in assuming that Truman and only Truman had the authority to order the bombing of Hiroshima? According to historian William Johnston, at the time of the bombing, field commanders had the authority. Truman changed this the day after the second bomb was dropped (on Nagasaki), explicitly requiring a presidential order for any additional strike. President Truman's first explicit decision about the atomic bombs stopped their further use without his "express authority." Despite Truman's later claims, he never sat down with his advisers, listened to their arguments and made an explicit decision to use the bombs. More accurately, he condoned rather than decided the atomic bombings of Japan. This source, its context, and further history over presidential vs. field commander control of atomic and nuclear strikes are discussed in this smithsonian magazine article, and this October 3, 2017 radiolab episode. "It is not to be released on Japan without express authority from the President." "It" refers to the third bomb, which Groves indicated would be ready for delivery on the target as early as August 17 1945. Truman said he had given orders to stop atomic bombing. he said the thought of wiping out another 100,000 people was too horrible. He didn't like the idea of killing, as he said, "all those kids." From these primary sources, Johnston's interpretation, that authority to order the release of an atomic bomb was in the field prior to August 10th 1945, seems reasonable. Not the answer you're looking for? Browse other questions tagged united-states world-war-two japan or ask your own question. Why would the heads of the Manhattan Project have been imprisoned in the event of its failure? Why was Hiroshima selected to be the city in Japan on which the first atom bomb was dropped?